Information collected from SourceForge, Code Complex, Google Code, Savannah, RubyForge and GitHub. 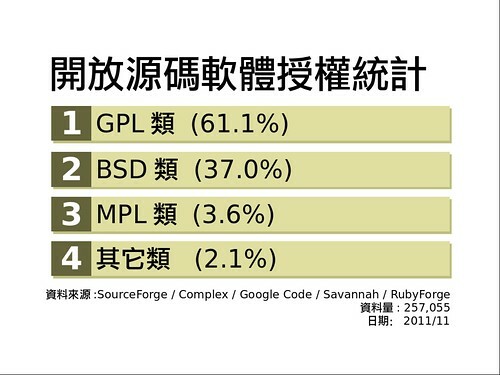 We can find, first, GPL-ed software may not as popular as orignal. Second, MPL-ed software also got slightly popular. 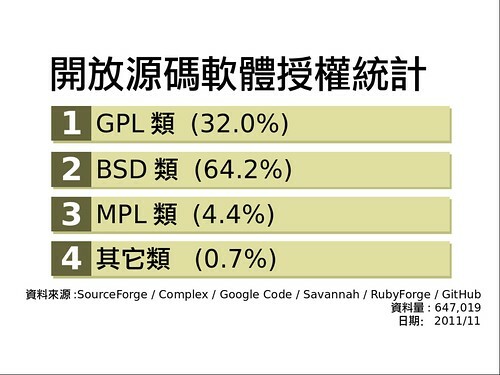 GPL-ed: GPL-2.0, GPL-3.0, LGPL-2.0, LGPL-2.1, LGPL-3.0, AGPL-3.0. BSD-ed: BSD-2-Clause, BSD-3-Clause, BSD-4-Clause, Apache-2.0, etc. MPL-ed: MPL, EPL, CDDL, etc. THE DATA IS PROVIDED WITHOUT WARRANTY OF ANY KIND, EXPRESS OR IMPLIED, INCLUDING BUT NOT LIMITED TO THE WARRANTIES OF MERCHANTABILITY, FITNESS FOR A PARTICULAR PURPOSE AND NONINFRINGEMENT.